Large Beach House across the street from the Atlantic Ocean in a private community of luxurious homes. Sit on the front porch and watch the waves as you enjoy a fresh seafood and steak dinner cooked on the gas grill by your private pool! Long Bay Estates enjoys the widest beach on the strand since we have no high rises for a couple of miles in either direction, and the Myrtle Beach State Park stretches for about one and a half miles along the coast. A walk up the beach takes you to the State Park Pier for fishing or ice cream, or walk a little further to Springmaid Pier for breakfast or lunch. We actually have the best of both worlds. We are second row, but next door to the Myrtle Beach State Park with the largest piece of undeveloped beach land on the Grand Strand. So you get the second row prices with the beachfront view. 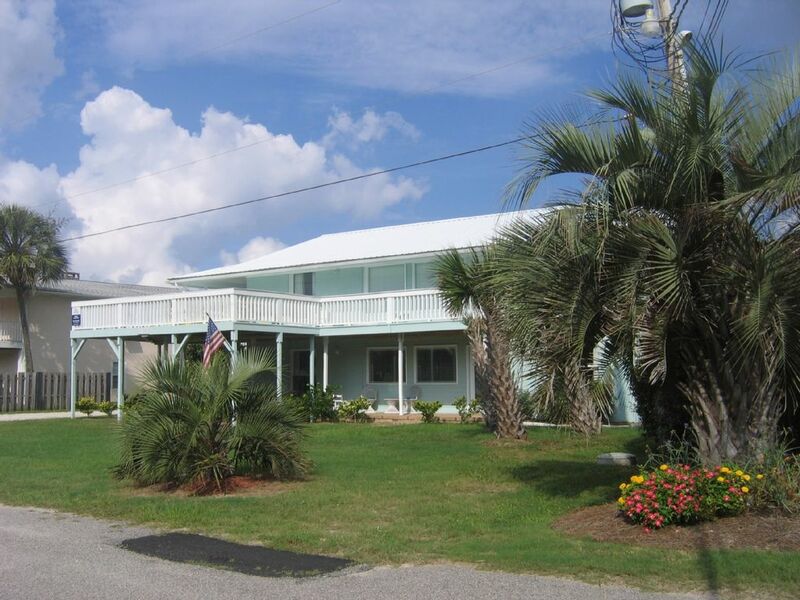 The boardwalk to the beach is only @ 50 feet from your beach house across a quiet cul de sac. Email Today for a Great Deal ! : You may bring your own linens, or we can provide you with linen service. Cleaning Service is included in our rental rates. No pets allowed. The sand fleas love them too much. There is no worry about who to call if there's a problem, since the owners live in the neighborhood. Email for any special requests. Email soon, we book quickly. Great Activities: Murrells Inlet is the seafood capital of South Carolina. When they say catch of the day, you can look out the window and see the boat where it was caught. Market Commons has many shops, restaurants, and a stadium seat movie theater. Broadway at the Beach has Ripley's Aquarium, MagiQuest, Hard Rock Cafe, and hundred of other entertainment, shopping, and restaurants. Of course, the beach is beautiful in the winter. We usually take a long walk on Christmas Day. The little ones would probably like the Children's Museum of South Carolina. It is all hands on fun stuff. We have been married over 50 years and still enjoy our lives together. Kyle is our daughter who manages our beach house. We welcome you to our piece of paradise. Long Bay Estates has been our home for many years. We love the privacy and relaxed pace of our neighborhood. We welcome you to share it with us. For an additional $100 sheets and bath towels will be provided for all 14 guests. Free of charge inside your beach house. Comfy seating for everyone in the family. Enough plates, glasses, and silverware for an army. A full bookshelf. Like one, take it with you. Leave your favorite beach read for the next person. Watch the sunrise over the ocean from your private deck ! Enter a tropical paradise with the whole house recently remodeled. A lush grove of palm trees and tropical plants greets you as you arrive and surrounds the pool. Get away from it all in your private oasis. Monthly rentals are available November through February. Sometimes we have availability into October & March. Owners nice and responded quickly. House was nice awesome location. My main problem was that the hot tub had been taken out after I booked my stay. No replacement or refund provided. It was a lovely location and the house was great. The owners were perfect hosts and were very accommodating. Location was great. Kyle and Bob were helpful and timely answering questions. All in all it was OK but could use updates and needs a painting doors were dirty by handles and needed to be painted.... And if you rent this you will only have the upstairs or downstairs so if someone else is there the same week you have to share the pool and grill and TV in living room is retarded it is a pain if you want to watch a movie you have to use the buttons on the TV and stand there and wait till the movie starts playing as you can not use the remote to start a movie but was OK just a pain! So sorry that you had a difficult time. All TVs have a cable box with a remote. If the remote wasn't working, I wish you would have called or texted us. We would have been over that day to fix it. The space was great for us! The pool and close proximity to the beach was perfect! We enjoyed our family vacation very much! This house fit all our needs and the beach area is beautiful! The ramp to the beach was just across the street. We could hear and see the ocean from our deck which we loved. The pool was nice, but got cloudy fast . The pump ran very little the entire week we were there. When we called the owner he sent a pool guy there, he fiddled round with it and it worked for a bit then stopped. I understand it was on a timer but, we never saw it working unless he came and adjusted something. We do appreciate the effort and the kids had a blast in the pool. The kids loved the fountain when it worked. The hot tub was great!! The outdoor refrigerator was great!! Thank you!! Fun and privacy in the heart of town. Only 20 minutes to Market Commons, Broadway at the Beach, Carolina Opry, Brookgreen Gardens, Huntington Beach State Park, Family Kingdom Amusement Park, and so much more. Golf: We have more golf courses per capita than any where in the United States ! Play a different championship course every day !